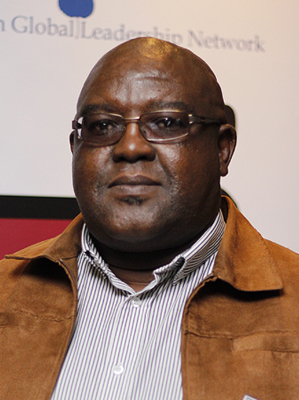 Bheki Makhubu is the editor and publisher of The Nation magazine, a monthly periodical in Swaziland that writes critical analyses on the country’s social and political situation while also breaking news. Started in the late 1990s, the magazine has become an influential player in Swaziland’s political discourse in a stifled environment that does not encourage independent views in society. It has become the foremost critic of government excesses as the country teeters on the brink of collapse due to a failing economy and has emerged as the lone voice in calling for political change as the only means to save the country from being a failed state. Previously, Bheki was the editor of The Times of Swaziland SUNDAY when, in 1999, he was dismissed from the newspaper after publishing a story critical of King Mswati’s and his polygamous tendencies. Bheki has been a journalist in Swaziland for over 20 years. He is currently studying towards an LLB degree with Unisa and has taken up to writing critically on the judiciary which he believes is crucial in any society that wants to achieve democracy. In March 2014, he was arrested and charged with contempt of court for writing an article critical of the judiciary which had begun to show signs of degenerating due to corruption. He was sentenced to two years in prison and spent 15 months behind bars. He was released at the end of June 2015 after the prosecution conceded that his trial had been a persecution conducted outside the bounds of the law. Bheki is the CNN Multichoice Press Freedom Award 2014 winner. He also won the 2015 African Human Rights Defenders Award for his valuable contribution to the advancement of Human Rights in Southern Africa, which was presented by the Pan-African Human Rights Defenders Network. He writes a monthly column for the Mail & Guardian and is writing a book about his experience during his incarceration. He is married to Fikile and has three children. He is a Fellow of the seventh class of the Africa Leadership Initiative-South Africa and a member of the Aspen Global Leadership Network.